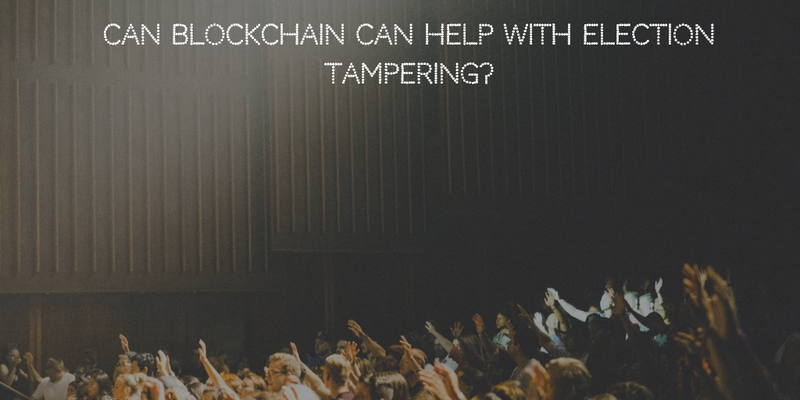 Can Blockchain help with Election Tampering? There have been a lot of protests and uprisings in various countries whenever the election process is about to begin or results are declared, the main reason being election tampering. Especially in the US, where the midterm elections are about the begin, the last presidential election is still being investigated for possible collusion by the Russians. Around 33 senators and 36 governors are contesting for the polls this year. Though the old ballot option is still viable, according to the Economic Times, more than 30 countries have started using or have already adopted electronic voting machines, India being one of them. Some of these countries are still piloting the technology. The three main businesses responsible for building the computer systems for these voting machines are Sequoia, Diebold and Election Systems and Software (ES&S). However, the technology used to build the same has quite aged and has proven to be insecure on various occasions. In the United States of America, 2016 elections were supposedly hacked by Russian hackers as much as in 21 states, according to a report by the Department of Homeland Security. Illinois officials have also confirmed that around 500,000 voter records were compromised as a result of this fiasco. How can Blockchain help solve the crisis? Ironically, Kaspersky Lab Business Incubator, a Russian cybersecurity firm, is the first one to develop an Ethereum based blockchain voting platform known as Polys. It uses a smart contact based system, which enables the user ballot verification and vote tally process to be carried out in a decentralized manner. This makes breaking into the system highly unlikely since the hackers would have to gain access to an entire network of computers. West Virginia, a state in the USA, will be the first state which will adopt a mobile app using the blockchain technology to tally votes. The system, developed by a company called Voatz, "Uses biometric authentication to identify individual users before allowing them to mark an electronic ballot, and the votes are then recorded in a private blockchain." With the inception of such applications, the rise in open sourced blockchain voting platforms has been emerging at a rapid pace. Since open sourced platforms offer the advantage of not having any proprietary algorithms, which further helps citizens and agencies to improve the functionality and the security of such platforms, many startups are focusing on using the same. VoteWatcher uses custom generated ballots which refer to unique tokens in the form of QR codes, thus preventing the same vote from being scanned twice. These tokens also help to unlock a "vote unit," which can be used to record and tally votes in real-time. Blockchain Technologies Corporation develops it. Follow My Vote is another open sourced platform which uses a webcam and an existing government-issued ID, allowing voters to cast their votes remotely. These open sourced platform might be the way to help contain to public distrust when it comes to the election process. Also, they help gain better insight as well as provide unparalleled transparency whenever wherever voting is to be done.